These are my Artists' books, handmade with love. The Spark (Careless Press): 20 pages, hand bound in soft cover, printed with archival inks and select original art pages in a clamshell case. Includes animated movie on flash drive. Book size: 3.25 x 4.5 inches. Carol Es une Monographie de Lignes (Careless Press): 153 pages, 65 B&W illustrations, hardbound letterpressed covers, and original colored pencil drawing in the front of every book. 8.5 x 8.5 inches. Details on Carol Es une Monographie de Lignes. Today's Quandary. (Careless Press): A little book about the process of creating Artists' books. 28 pages, letterpressed covers, saddle stitch, and an original colored pencil drawing in the front of every book. 8.5 x 5.5 inches. More details about Today's Quandary.. Houses (Careless Press): Handmade by Carol Es. Stab bound, 20 pages, 6 x 9 inches. Farber | Es (Chance Press): Neil Farber and Carol Es. 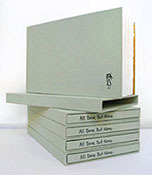 Hand bound, 36 full-color pages. More details about Neil Farber | Carol Es. Carol Es Catalog (Careless Press): Commercially printed, perfect bound, paperback, 27 pages. Full color images with essay, bio and artist's statement. 8.5 x 8.5 inches. More details the Carol Es Catalog. Inside/Outside (Art House Co-op): Hand embroidered cover, 40 page moleskin with handwritten text in pen and gouache art made as part of The Fiction Project for the Brooklyn Art Library. 8.25 x 5.25 inches. Monsters on Jasmine St. (Bottle of Smoke Press Press): Hand sewn, letterpress cover book of poems and full color illustrations. These come in 3 editions: paperback, hardcover and a small deluxe edition. 8.5 x 7 inches. More details about Monsters on Jasmine St..
Sketches (Chance Press): Hand sewn sketchbook which originally appeared in Scribbles in a Sandstorm. This is a private edition and includes a small original sketch of Dan. 5.5 x 3.75 inches. Scribbles in a Sandstorm (Chance Press): Hardcover, hand bound, accordian Artists' book with removable spine, containing a 40" color panorama. On the flipside: a Gocco print, a letterpress print, as well as a bound-in sketchbook and an original signed sketch. 7 x 7 inches. More details about Scribbles in a Sandstorm. Horsebucket (Careless Press): Drawings from the artist's bedside sketchbook. Pages are individually typed on an old, Underwood typewriter, making each book unique. 24 B&W pages, letterpress covers, 5.5 x 8.5 inches, comes in a cute brown box with an antique label. Sweetnsour Pie (Islands Fold): A deep and personal publication from Islands Fold, located on Pender Island in BC, Canada. 20 xeroxed b&w pg, 5 X 7.5 inches, die cut cover in a variety of colors. More details about Sweetnsour Pie. All Done But None (Careless Press): Original handmade book on indecision offers up true-to-life stories as various options for the book's direction. These childhood tales include bad dreams, avoiding school, playing drums in a rock band, and revelations of a dysfunctional family life. 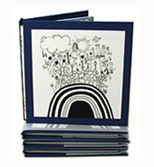 Each book is handwritten and illustrated in watercolor and ink with 3 etching prints. 7 x 12 inches. More details about All Done But None. 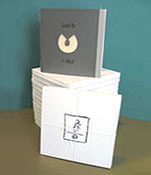 1-SELF (Careless Press): A handmade catalog and artists' book rolled into one. Title suggests dual meaning of both intimate self-expression and the artist's pattern-making background. Die-cut letterpressed cover, original watercolor, 14 archival full color images, original block prints, and essays. 8.5 x 8 inches. MOMS: Carol's first artist's book ever. A 9-page original handmade book about moms created in 1975. It is drawn in pencil and crayon and bound in scotch tape. Every page has hand written text in pencil and illustrations with pencil and crayon. Approximate size is 5 x 6 inches.